I have something to tell you, Bibi. My son came home a few hours ago. I was very surprised and happy to see him. He is a combat soldier serving in a very well-respected unit. 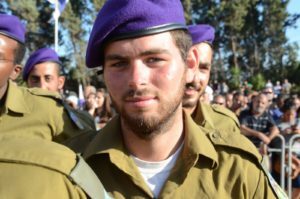 He is the third and youngest of my sons to serve…the first in Artillery, the second in Kfir, and now David. I have trusted the army. I have trusted you. I trust you now to be a strong leader of Israel. Normally, when they release them for the weekend, they come home at best, Thursday night, often Friday afternoon. He walked in the door before 9:30 a.m. because it was so hot and because this week they’d given them a break. I thought I would have all weekend with David, so without a second thought, I told him I’d see him later and went off to my painting class. Two hours a week. It is my sanity, a small gift I give to myself. And then, less than an hour into the class, David called and because it’s a habit with a son in the army, I answered the phone in the middle of the class, “the army called and I have to go back.” The class stopped and everyone looked so sad for me. He was home for two hours. My weekend is shattered; my heart breaking, my eyes filled with tears. You have been father to two soldiers. You know what home means to them and what it means for them to lose out. The reason he was called back is likely because of what Israel is expecting to happen tomorrow. A great wave of hatred. A wave of violence. That is what is coming our way. The nations of the world are scared and are beginning to make demands. Not that THEY stop the violence but that WE remove the metal detectors that were installed to stop future terror attacks like the one that resulted in the deaths of two Israeli policemen last week. The Muslim leadership is calling all Muslims to close their mosques and march on Jerusalem. A wave of bloodshed – that is their intention and their goal. On a scale of things, this is tiny. I know you have so much more on your mind than one soldier and one mother. I will spend the weekend without my son. He will be on guard because that is what he has to do. I will spend it thinking about him, worrying about him as I do all the other days of the week. That is what I have to do. And now it is your turn. You have to do what is best for Israel and that requires you to be strong. Don’t bend, Bibi. Don’t give in. Putting metal detectors is not demeaning, it is not insulting. They have them all over the world, Bibi – every airport, every important site. They have them in Mecca. Don’t bend, Bibi. Don’t give in. We have done nothing wrong and if you remove them, you might as well tell us all to start packing. This is our home. We have nothing to apologize for or about. They attacked us on the Temple Mount and without infringing on their right to pray there (as you allow them to infringe on ours), we demand that you secure the place. If their pride is greater than their desire to pray on the Temple Mount – that’s up to them. Soldiers that were supposed to be home this weekend are willingly paying the price by going back or remaining on base, ready, alert. They are prepared to stand strong and defend this land. You can do no less, Bibi. Once you did it in the uniform of the Israel Defense Forces. Today, your uniform is that of the Prime Minister but the burden of defending our rights here – as Jews, as Israelis, is on your head. If you buckle this time, we all fall with you. The Temple Mount is our history and it is our present and future. We have not gone to war over it – perhaps that was a mistake. Instead, when the Temple Mount came back into our hands in a war we didn’t start, we offered the Muslims something they had denied us – religious freedom and the opportunity to continue praying there. But then and now, we retained the right to secure the location for all. Last week, Muslims violated that security and murdered two Israeli policemen. You responded firmly and correctly. Don’t ruin it all now by giving in. We stand with you, Bibi – but we won’t fall with you. Don’t bend, Bibi. Don’t give in.